Bach�s Sonata for Solo Violin # 1, Presto is by no means a beginner�s piece. It requires a keen sense of timing, a great deal of dexterity to hold various barre chords and a great deal of alternate picking and sweep picking skill (though the piece can be played entirely with alternate picking). It also has us paying close attention to phrasing. The combination of these techniques presents the guitar player a tremendous challenge and the payoff is readily seen � in a matter of weeks you will notice significant improvements in your technique, regardless of whether you are a beginner or an advanced player. Lately I can�t seem to get enough of classical music. Though I have certainly played classical pieces on my guitar in the past, it wasn�t until recently that I developed a further appreciation. In the past I simply played pieces with no regard to the intent of the composer. But thanks to my classical guitar teacher (Audie Bridges at The Music Emporium in Lexington, MA), I know realize that there is quite a bit involved in analyzing these pieces such as to maintain the intended phrasing and to play up to tempo. Going over the various nuances of this piece is well beyond the scope of an online guitar lesson. I highly recommend seeing a classical music teacher if you are serious about pursuing pieces of this sort. But even without the coaching of a good teacher, you will still do wonders for your technique by practicing this piece. As seen from the tab, this is what I like to call a very non-linear piece. That is, it is not made up of simple scalar runs that lend themselves to speed. The piece is made up of a never ending variety of intricate lines that must all be played at a steady tempo. I recorded the excerpt at a tempo that is fairly typical for guitarists (violinists generally play the piece a little faster). The most important point for me o make about this piece is to not get caught up in the tab. 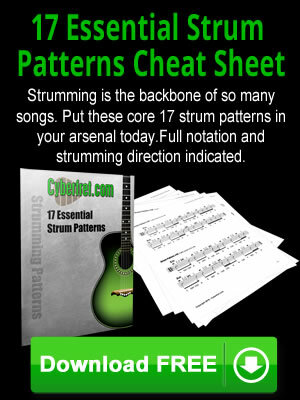 The way I tabbed it is based on various sheet music arrangements I have come across as well as personal preference. So if certain sections are problematic for you, then experiment with other fingerings. Really focus on the tricky parts. For me personally, I find measures 12-16 to be the most difficult. As if the string skipping isn't tricky enough, there is the added challenge of needing to let the first note of the measure ring all the way through. The is accomplished by holding barre chord positions during these measures.